I did ask James a while back if it was possible for the creator of the thread to change the title and it is not. It is a shame as you have people following specific threads so you don’t want to lose them but the ability to amend the title would be very useful. The trend has changed during the time period of this thread so the discussion has to be fluid enough to discuss the upward trend in place now and going long opportunities. US 500 and the other US indices such as the Dow Jones and US 100 are showing a drop today. This could be profit taking which would be understandable thus taking out trailing stop losses along the way and creating new shorts as a result. The next leg upwards via some sideways activity could follow. Could this be when the US indices turn - create a trend reversal - and head downwards? The rest of this week will be rather interesting but also overnight will show what Asian traders are thinking. When any potential downward correction comes I am expecting it to be very sharp and quick, far quicker than the time it took to go up from Christmas onwards. To me it seems the strength of the trend is weakening. Yes there has been recent upward movement but the momentum and strength behind that upward movement has shown some weakness. Bonds had a great day today as a result. Bond prices will be worth keeping an eye on. Normally that is an indication of capital shifting from riskier assets to more less risker assets. It is a defensive move when it is thought that equities may see a large correction or downward pressure. One thing is for sure, don't be surprised to see an increase in volatility. The 'hawks' as I call them will be waiting on the sidelines looking at the optimum time to pounce with shorting US indices. It will be the largest Hedge Funds around the world and the largest investment banks. I do just wonder if the impending announcement in relation to US-China trade talks is actually priced into US markets? What will happen once this announcement is made or any conclusion to this ongoing saga is confirmed via the media? Will the price action turn bearish on such positive confirmation? This has been seen several times so it would not surprise me. Or will the US markets kick on and make new highs? My profits are getting smaller and smaller on daily 'long' trades on US indices which is indicating to me that the strength of the price behaviour is beginning to wane. US 500 has gone below its 20 DMA. This is the first signal for a potential shorting opportunity. Aggressive traders may consider shorting once this is crossed. Aggressive trend followers may consider shorting at this juncture too. Around the $2746 level presents an opportunity where the price goes below its 200 DMA. This presents an excellent entry point for a potential short position in my opinion. If it goes below its 50 and 100 DMA's respectively then this could be a potentially big drop. It could be sharp and quick. My timing has been out before but on this occasion the trade deficit news which has just been released in relation to the US has given the impetus and narrative for such a move downwards. Now the opposite could happen and this could end up being a mini correction before the resumption of the upward price behaviour. This is also possible and one simply cannot rule this out. The trend seems exhausted to me. However this could easily lead to nothing more than a rest and then a stronger move upwards wrong footing all the potential shorters. My gut and instinct is telling me that a potential shorting opportunity is arriving very soon but my gut and instinct have been wrong before so lets see what the price action tells us. I have stopped day trading US indices on the long side as the risk is too great at this moment in time. 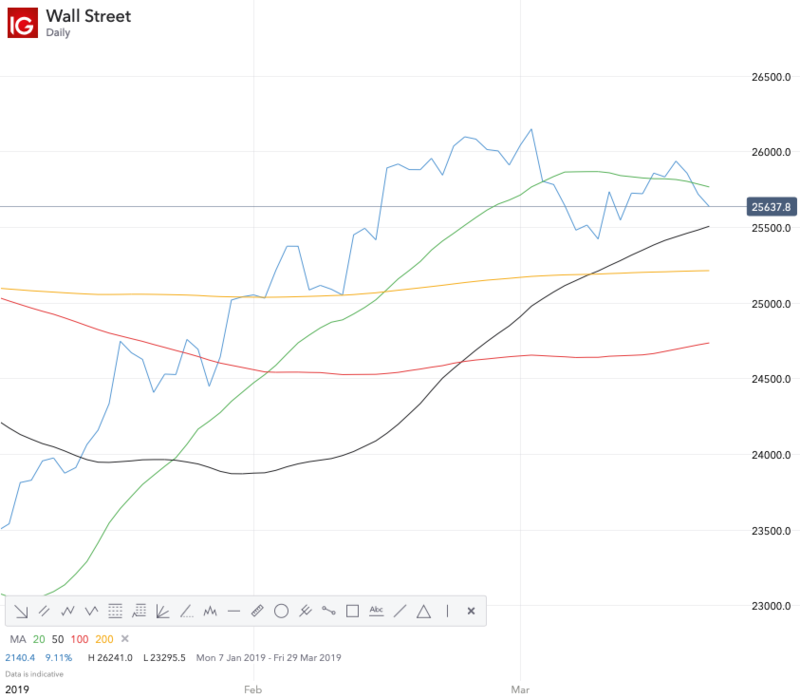 Is the Dow Jones turning bearish? 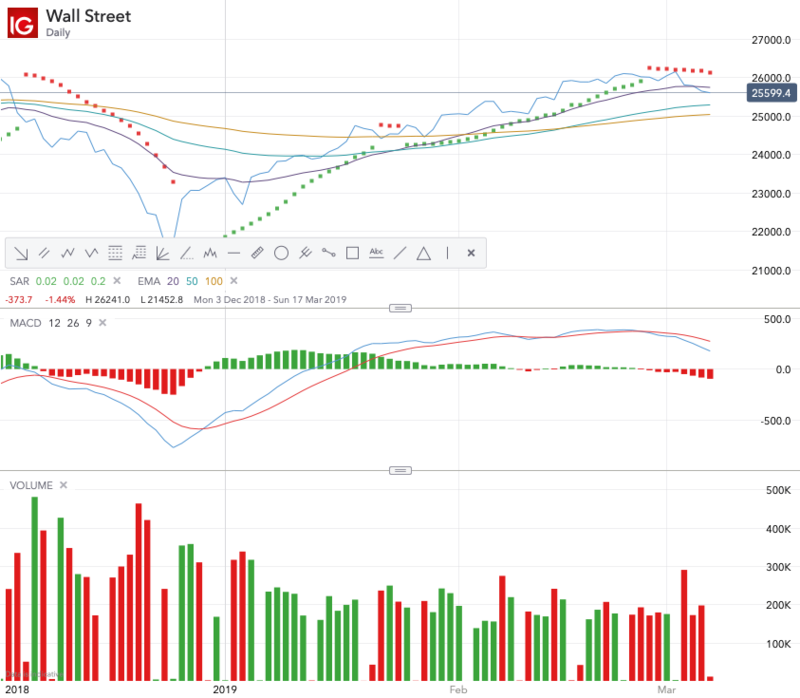 If one looks at the volume in March 2019 especially the red bars then it kind of paints a sketch. It has gone below its 20 Exponential Moving Average (EMA). This puts more emphasis on recent price action and is weighted more towards that which is why it is a really good indicator to use in my opinion, especially when trying to spot trend reversals or new trends to price monitor for potential trends. What is really interesting is the Parabolic SAR. The red dots above the price indicate a downward trend. I have tried to keep this post as simple as possible as I am aware of my 'audience' and have also received feedback from many stating that they appreciate my simple and straightforward analysis which they can follow more easily. I had a read of this thread, and don't take this the wrong way but a lot of what you're encouraging people to do is going to cause them to lose money. Mainly because you're holding short into support and long into resistance as that's in the direction of the current 'trend', but you need to anticipate the end of trends too or you end up giving back huge chunks of profits, or worse, if you've added to your positions, end up over leveraged and with big losses. For example, in December, 2350 was the 200 week MA, and also marked 20% down off the high. Typically in bear markets, that's the kind of area where the first bounce has come in. On top of that, on Xmas eve you had the PPT conference call so you know there's the possibility of a strong rally off there. You then added into the first bounce and it never retested the lows. The market was extremely oversold so it was obvious there would be a huge rally as soon as momentum turned around. Then on Monday you're talking about it being in an uptrend so looking for long entries, but the trend has been weakening since last week and price was right at the horizontal resistance in the 2810s. That's a sell set up not a long, regardless of where you are relative to the MAs. I see that now you're saying under the 200 day in 2740s it's a sell, personally I can see it running to the downside for a while, but you're wasting 70 points by waiting for that, and obviously the risk to shorts is right back up to 2800s, so it's critical to get in near the turns and not half way to avoid the whipsaw. For any newbies reading this, I'd say you should focus on being in control of your trades and avoid large drawdowns. To do this, you should focus on little and often. By that I don't mean taking profits as soon as any trade turns green, but I mean that you should focus on 2-3:1 risk reward set ups, try and cash profits every day/few days. It feels good to cash profits, it keeps you fresh mentally and unbiased. The key to this game is keeping the losses small.. you should be winning 50% of the time and losing 50%, with the gains bigger than the losses = profitability. To make the big money it's all about consistency and being able to incrementally increase your leverage.. you won't manage that if your gains are lumpy and inconsistent, and you have large drawdowns. Only risk 2% of your account at a time, set a realistic target for the week and keep building. In addition, I tend to find that markets often bounce around multiple times between levels so this approach allows you to take profits and play the same set up many times over... if you hold on you tend to get annoyed waiting for breaks and sometimes they don't come. Very few people can hold trades and make money, and that's the truth. Because it's very hard to determine how long a trend will last, and psychologically it's also very difficult to sit in positions and not do anything - invariably that leads to adding to trades and losing control of exposure which is a recipe for disaster. You become dependent on your market calls to make or lose money, whereas profitable trading is reactive not predictive. Not saying any of this is easy, but need to give yourself the best chance of being profitable and that doesn't involve adding to positions in random places, chasing momentum and not taking profits at very clear support and resistance areas. First of all thank you for taking the time to read this thread and no I won't take it the wrong way. I think one should accept open critique and challenge as long as it is polite, professional and does not try and belittle another. I am not trying encouraging anyone to do anything apart from the following. My intention was to share some live trades to encourage others on the IG Community to share their live trades so that it improves the experience on the IG Community and adds value and substance rather than words, charts, lines, links but no real trading value or examples. Obviously my intentions were not successful as I cannot recall anyone sharing any sort of live trades with the rest of the IG Community in real time. I think a lot of traders may be scared what others will comment, scared they may lose credibility and even possibly a tad selfish that may not want to share those trades where they may make money and profit or even share all the losses they may be making. The only reason why I picked US 500 and US indices in general was as a lot of people were commenting on the IG Community in relation to this at that particular time and I felt it may start the process of sharing live trades. I also at the very same time shared live trades on Gold and Silver (Potential Long Trade - Gold). I happened to exit Silver and Gold both on profitable trades which more than covered the loss on the short US 500 trade. I cannot recall anyone else having the courage, guts or helpfulness to do so. It is very easy to comment on others and it is very easy to lead the blind. It is very easy to post links with lots of data and lots of charts. It is very difficult to really want to help others and to share live trades even if they fail or are not profitable. These were two tiny trades from me just to garner interest and interaction and nothing more. My serious trading (the part I keep to myself - secret) 😉 is Commodities and Cryptocurrencies both 'long' and 'short' using trend following principles with my own tweaks based on my own experience. I do not really trade FX or Indices but was particularly interested in US indices and to be fair still am. As someone who follows trend following principles I do not anticipate ends of the trends. I let my winners run and only exit on a confirmed trend reversal but if that is how you trade then that is fine and I am sure it may work for you. If you read my TrendFollowing by TrendFollower thread then you may appreciate my trading philosophy more but I do not expect others to emulate me or even agree with my trading philosophy. I accept trend following is extremely difficult and is not for everyone. Some of what you say I actually agree with. However I personally (do not expect anyone to follow this) do not work on a 50% win formula. I try and cut my losses quickly and let my winners run. So for example I may have 10 trades where I make profits on 3 and losses on 7. As long the profits on my 3 are greater than my losses on the 7 then that is what I am aiming for. On the face of it, it looks like 70% failure rate and 30% success rate but I do not look or pay attention to such percentages. It is the overall profit which is key. Why should you be winning 50% of the time and losing 50% of the time. I do not agree with this at all. The key is to make more profits in a year than losses. The bigger the gap when you make profits against losses the better. You sort of touch on upon this. I personally follow trend following principles as it has worked for me over several years both on the long and short side. However, I appreciate their are different trading styles and different methodologies that others will have that will work for them. Taking profits every day or few days goes against trend following principles unless your trailing stop was triggered as there was a trend reversal. Please do not take what I am about to state the wrong way but at the moment what you have stated are words. It would be so helpful to the IG Community and especially newer more inexperienced traders if you shared a live trade demonstrating the live execution of your words. This way they can all see it in action. Do not worry about the trade being profitable or not as none of us have a crystal ball but sharing that real trade where you put words into action is key and this is the part no one seems keen on doing. I have tried to lead the way as a 'tester' but no one has really followed or embraced this. I totally understand why 'newbies' would not want to share their trades and why they would be scared. However those who think they know it all or those who think they are always right or better than others have also shied away which is rather surprising and disappointing. Even those who believe they are more wiser, more knowledgeable and more experienced have not dared to show even a 'snippet' of a real live trade they have executed. You are right, it is not suppose to be easy. Trading is extremely difficult. That is why just because very few can hold trades and make money does not mean one must not try to achieve this. Some of my best trades in the likes of Lumber, Natural Gas, Orange Juice have been to hold and let my winners run. It has been to hold and do nothing. This truth does not mean one must not hold on to their winners and let them run for as long as possible. The beauty of trend following is that there is absolutely no need to even try and determine how long a trend will last. When the trend reverses then your stop loss will be triggered and you are out. If you are in profit then your trailing stop will be triggered based on your risk management strategy and risk tolerance. Just because it may be difficult to sit in positions and not do anything does not necessarily mean it cannot be a profitable strategy. I agree with your last sentiment that profitable trading is reactive not predictive. To put this in context my trades which I shared were if you like 'tester' trades to try and entice the IG Community to share live trades in which I did not succeed. It was nothing more so please do not read anything more into it. However, I would be more than happy to follow and comment on your live trades and offer my thoughts should you feel confident in applying your words of wisdom and sharing any live trades using your own trading advice. I hope you do take up this offer and let the IG Community travel on this journey with you and embrace the experience. Even if the trade makes a loss then this is still a valuable learning exercise on what possibly not to do or even a lessons learnt exercise afterwards. Another potential shorting opportunity has presented itself on all three of the major US indices. There is still a lot of volatility throughout the day so I am thinking whether there is any merit day trading on the short side like I did on the long side. This would eliminate the risk of larger losses and I could cut losses as short as possible as I would be exiting the trade daily. I would also be taking profits daily should the price move down when shorting daily. I am just contemplating this idea and there are several price fluctuations in throughout the day which could easily trigger stop losses if they are not wide enough. 'Mr Market' knows that text book advice will be to keep stop losses tight and minimise losses so it can scoop away at those traders' stop losses. This week will be rather interesting and I expect there to be lots of volatility not just throughout the week but throughout the day. Swing traders may find lots of potential this week. Selling FTSE into 7160, first target is Friday's close price at 7104. Would stop the trade out in 7170s, and at that point might expect another test of 7200. More detailed explanation coming up, and a reply to the points you've raised. Once you physically open the FTSE trade then please do share if you feel comfortable or you may want to set up a new seperate thread where we can follow your live trade. You could then drive this thread based on your specific trades. I think that would be great for the IG Community. However only if you feel both comfortable and confident in doing so. Many do not. They like posting, making suggestions, sharing but cannot share a live trade because of fear of failure. If only trading were that easy that you could follow certain indications and theory and be profitable the majority of the time. It is extremely difficult. At the moment you state ‘would’ and ‘might’ and these are merely words which represent vagueness to me. Do not feel like you have to respond to me. I think the way to demonstrate you are right is by sharing a real, physical and live trade and then we can all learn in real time and follow your rationale behind your entry and exit points. Unfortunate stop out @Mcg but it does demonstrate the problematic nature of calling trades. Most traders struggle to get a 50/50 win/loss ratio and rely instead on a advantageous risk/reward ratio to define success. So individual winning or losing trades are meaningless in the greater scheme of things but they will be used by observers unfairly to 'rate' a traders proficiency and a small string of losing trades is usually enough for them to dismiss altogether. They will rarely hang around long enough to find if you are profitable in the long term or not. This is often how novice traders define their own trading skills and so a small number of losses is usually enough to cause constant system hopping until their account has finally evaporated and is a reason why they desperately search for someone to copy. It takes time to discover trading is about the long haul and that though the rationale for a trade may be sound it is no guarantee of a successful outcome. Guys, firstly to follow up at what I was looking at - on the 4 hourly I could see some symmetry with a prior pullback off 7160, and on top of that we had the gap right down to 7100 area. FTSE is basically a choppy mess in recent weeks... 7185-7065-7260-7040-7210-7080. Lots of whipsaw on both sides. Would be amazed if eventually we didn't break down towards 6900, which makes selling the rallies towards the top end of the range preferable to me, but also looking at longs if they set up towards the bottom end of the range. Other markets are showing signs of weakness, with sterling weakness insulating FTSE - but the way I see this week going with Brexit, either the EU give some concessions and May is able to get her deal through, or the deal fails, the House of Commons votes down no deal and votes through an extension of Article 50. The latter is more likely than the former, and in that event I think sterling would rally because the odds of remain increase significantly. As for the trade, it was deliberately vague as I'm just reacting to price, so my actions are dependent on what price does. As I said, I saw the possibility that 7160 would be a minor high for some selling. At the point of entry, I had a hard stop on the platform of 20 points, which I do for all of my trades (so 7180). If the market had carried on going straight up after entry, I likely would have exited prior to that being triggered, that's just my worst case stop loss. As it was, the market pulled back from 7165 to 7142, so I moved my stop down to 7166 (one tick above the high), then that got triggered for -6. Having another go as I type from 7175, this time the stop is 7185. I only really posted this as in his last reply @TrendFollower , asked me to post some of my trade set ups in real time. I average between 2 and 5 trades per day, win roughly 55% and aim for 2-3 times my stop on the winners. All in all, this averages me 25 points net profit per day on a fairly consistent basis. I've got no real interest in typing out every time I do something, as you have entries, initial stop loss, profit taking (which sometimes isn't the whole position) plus moving stops, so on 5 trades a day you're easily talking about needing to make 15-20 posts, and if you don't get them posted exactly in real time, which is hard as you've got to type them out as well as focus on the market which is obviously the priority, they're pretty much useless to anyone reading (and you'd also only have to miss one post to make a real hash of the trades). I honestly believe that people are better off developing their own systems rather than attempting to follow somebody, so wouldn't mind helping them with that. I agree with @Caseynotes that each individual set up is meaningless on its own. I'm risking 1% of capital on them (assuming I were to lose 20 points), and obviously I have no control over what the market does. All I'm doing is tilting the odds in my favour via disciplined risk management and perseverance. So I'd prefer to keep things high level, maybe make comments around what the bigger picture patterns are and make points around strengths and weaknesses of different trading systems or risk management strategies. To follow up on your reply @TrendFollower, I must admit I only trade stock indices, and don't know a great deal about crypto or commodities. But I can imagine that those markets often trend much better than the indices, given there are way more variables moving stocks. With the stock market, you have earnings, currency, interest rates, economic data and general risk appetite all playing a role in direction, and often times in opposing directions which leads to the chop. Commodities like oil are famous for trending as they move just based on supply and demand so its cleaner. So my first post was specific to stock indices really... I think you've hit the nail on the head with your Saturday 18:05 post when it comes to trading indices. Determine the trend/range, trade in the direction of the trend/fade the range, and take profits regularly. It would have to be trending pretty strongly (like the Dow in 2017) for pure trend following, adding to positions etc to work better than playing each day's set ups as they come. Well put. I could have worded it better. If you were to look at the number of losing trades that I have then it is far greater than the number of winning trades that I have over a reasonable long period of time. I am open and honest enough to admit that I make plenty of losses. I learnt early on that one must embrace losses and not be scared of them. In amongst all these losing trades, I have some big winning trades and it is those big winners that really allows me the opportunity to make more profits than losses. It is extremely hard and certainly not easy. My strategy does not rely on support and resistance as that would eliminate a lot of big trading opportunities which go on to become strong trends. I agree with your post. Well explained. Yes I largely agree with your comments. I think we are all trading differently and have different strategies and systems. My own personal trading strategy and system is based on trend following principles with my own adjustments and tweaks. My trades can last from a few days, few weeks to a few months. I have no predefined exit on my winning trades apart from when my trailing stop loss is triggered. However, I do have a pre determined exit on my losing trades due to my stop loss. You seem to place quite a few trades and may be more of a day trader. I may only trade a few times a month so my frequency is a lot less. I now better understand your trading style so will bear this in mind for future discussions. I totally appreciate that trend following is not for everyone and there are not many trend following traders that have made themselves known on the IG Community. I am most probably the most well known and frequent poster using such principles. There may be others that I am not aware of. Taken half of the FTSE 7175 short at 7143 in case anyone was wondering, stop to b/e on the rest and see if we can get 7100 area. Just look at the US indices go today! A wave of blue across the Dow, S&P and Nasdaq. 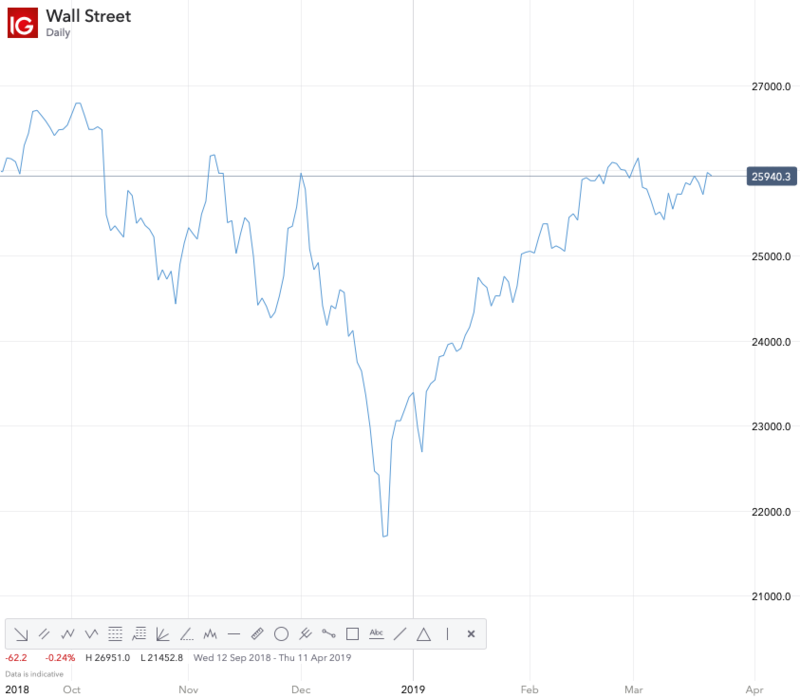 I think there has been a recent short term disconnect between the Dow Jones in relation to the S&P 500 and Nasdaq 100. The question now is whether the S&P 500 and Nasdaq 100 will follow the Dow's lead or not? Well the US indices are just continuing to go up and up. 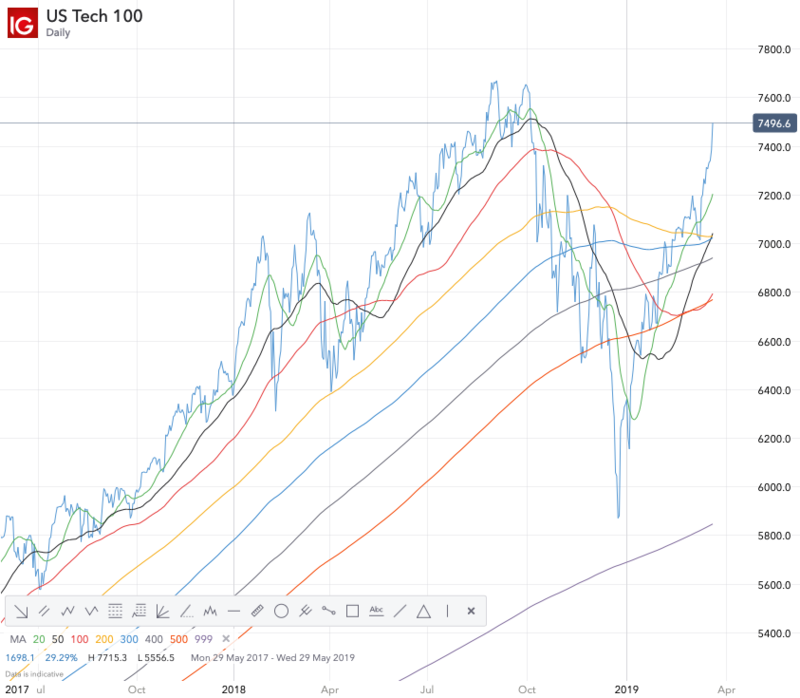 The Nasdaq seems to be leading the way from a chartist perspective. Patience will be the key. Right now I would not suggest going against the trend. I think one should either trade the US indices on the long side or day trade them on the long side which is what I have been doing recently. One must wait for the any major correction to take place and react to this and try and ride any trend downwards rather than try and predict them. There have been many times recently when one could think the US markets are going to tank and they just continue going upwards. The market does not behave like the majority of traders think it should. The market, the professionals, the large institutions and the complex algorithms know what the general traders follow in terms of technical analysis and text book theory. It can be programmed to take into account indicators and theories into its trade execution strategy. It can act in nano seconds whilst the normal trader is busy following certain technical analysis theory they have learnt and getting the trades wrong. There is nothing wrong with getting trades wrong. That is part of trading. One must realise that technical analysis cannot guarantee how the price will move going forwards so one must look at trade execution which puts odds and probability in their favour. In my opinion this is based on current real time price action rather than historical price action. At this stage I would be inclined to wait for confirmation of a trend reversal before even thinking about going short. These are tricky times. I got my timing wrong even when I did wait for what to me was confirmation of a trend reversal so there is execution risk with shorting the S&P 500 for most of us. For me the S&P 500 is at a critical stage right now. It is either going to break through resistance and continue upwards. It is going to drop like a stone with some bounces upwards along the way due to the impact. @Caseynotesmade an interesting point on another thread about how some are looking for the short as the downside risk is potentially limited but if the price falls then the reward is big. I can see this logic but I myself would want to wait for the price decline to begin before entering just to put the odds and probability in my favour for success in the trade. Of course there is still no guarantee but I would rather sacrifice the profit over an increased chance of success. If the S&P 500 falls as some of us thinks it will then the gains are going to be big anyway. I just have this small feeling in the back of my mind that when the media reports that US markets may go down, when traders such as myself start thinking US markets could go down, then these markets end up going sideways to upwards. This is the big risk on this trade. The only way to mitigate this risk is not to enter too early. Wait for the drop to commence and if it is an initial large drop then this will begin to trigger stop losses, encourage new short positions to open and profit taking. This will amplify any move downwards if it were it to occur. If this does not happen then one must be disciplined enough not to enter. Remember, I have already got the timing wrong on this trade so discipline will be key. 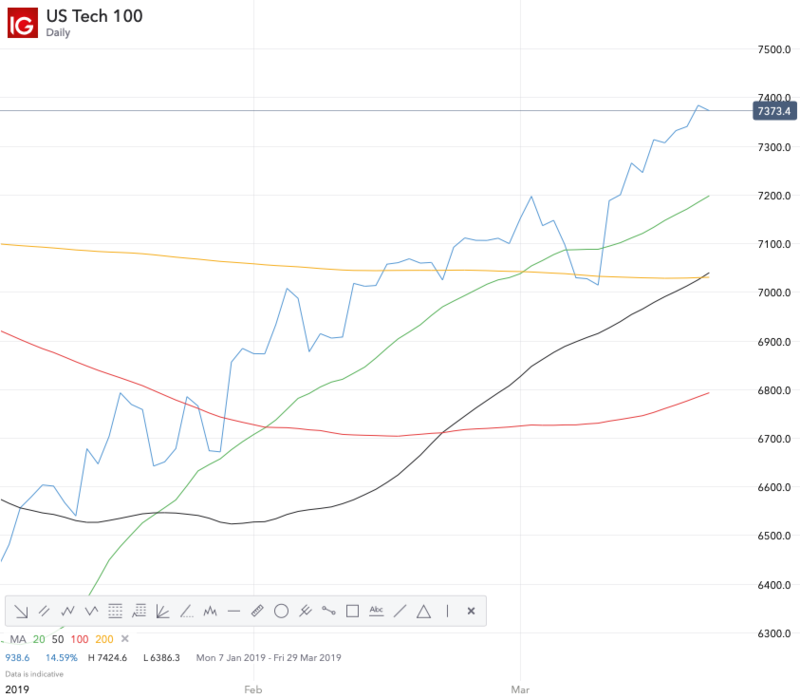 US indices are brushing away any delay on the confirmation of US - China trade talks. It is brushing away any uncertainty over Brexit. Trump actually stated he was looking forward to negotiating a trade deal between the US and UK if UK leaves in a no deal scenario. I think it was Elle that shared a chart where if past historical trends were compared then US indices could see sideways to upward price action. Obviously past performance and trends do not guarantee that future performance and trends will be the same. However it was rather interesting based on current price action and the chart for US indices. The question I am asking myself is whether the drop has commenced? From the daily chart perspective it does not look like it has yet for the Nasdaq 100 but is looking interesting for the S&P 500. 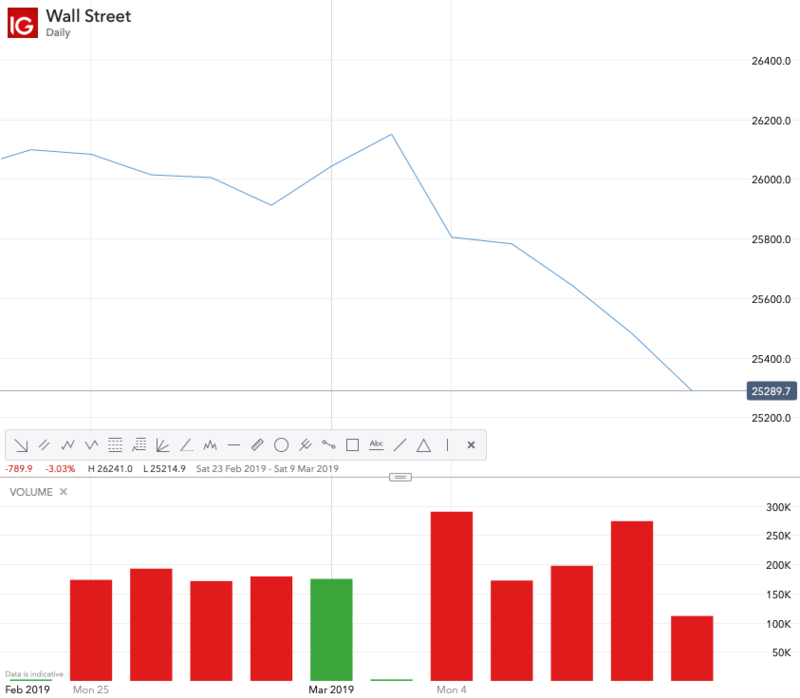 The Dow Jones seems to be leading the way in price decline. This could just be a small correction before any upward leg resumes as it may take a few hours / few days for the US indices to react to the US Federal Reserve news of not raising interest rates in 2019. At this moment the Dow Jones has its price trading below its 20 DMA. This is what aggressive trend followers look for initiating a short trade. However, this would be an extremely high risk trade. Others will wait for the 50 DMA to be breached before initiating a short trade. Of course some will do so during any period in between the 20 and 50 DMA. It is all down to a traders risk tolerance and urge for more speculative trades. 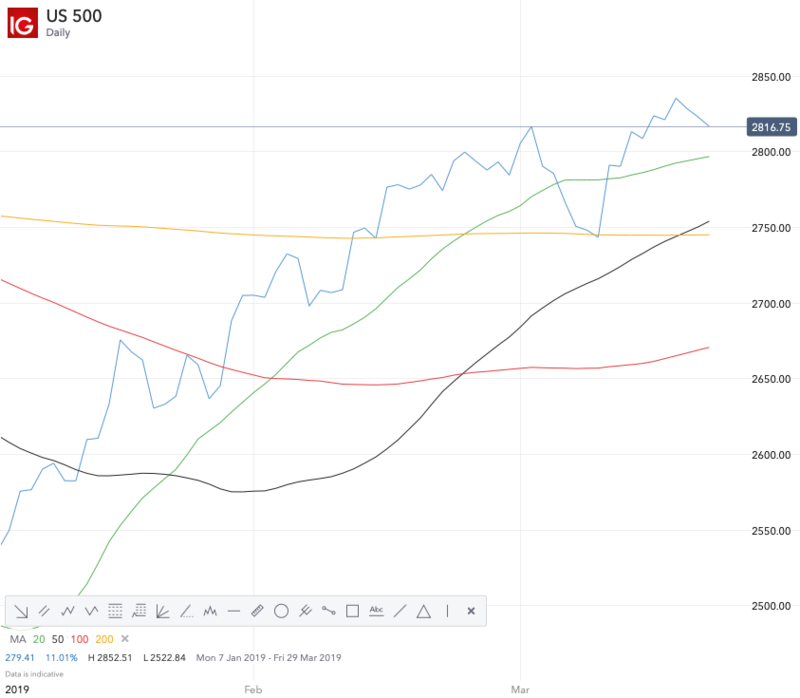 Now the S&P 500 and Nasdaq 100 have not yet gone below its 20 DMA so these are lagging behind the Dow Jones if there is to be any significant move downwards. This is the part which is unclear. All three US indices have attempted such moves down before, for only to come back up again. I appreciate this thread is called US 500 - Potential Shorting Opportunity but boy have I been wrong when starting this thread. In fact I have been day trading on the long side recently. I accept that I did not envisage this length of rally after the initial huge drop. I am not suggesting that a large shorting opportunity is not possible but at the moment my thoughts are never go against the trend and never fight the price action. All three of the US indices are pretty aggressively pushing upwards. Now it is possible that this last leg is what breaks the US indices into submission and they plummet downwards. Those contrarian traders may find an exciting risk / reward opportunity. At this rate the US indices could easily make new 52 week highs! The Nasdaq 100 has seen some very aggressive buying. The long term trend is upwards. Are there any traders on the IG Community who would trade against this trend? Are there any traders who still think that US indices are going to go down a lot lower or are already shorting them? I tried to short and in my own defence it was during the large drop in around December 2018 time if I remember correctly. So I was trading short with the trend. Obviously we know what happened next! My timing was wrong and I should have shorted it a lot sooner as the short trade was on but I got in too late and my stop loss was too wide so ended up with a loss. I remember Elle posting a while back a chart which inferred that there could be some sideways movement with a tint upwards. This seems to be playing out that way in relation to the Dow Jones.